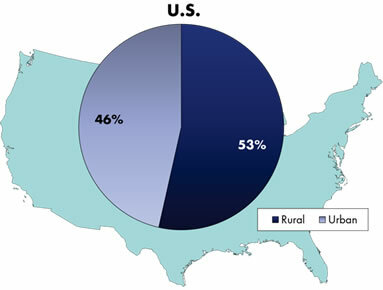 According to the National Highway Traffic Safety Administration (NHTSA) in 2013, rural areas accounted for 53 percent of the fatal crashes as compared to urban areas, which accounted for 47 percent. Crashes on rural and local roads are typically spread over hundreds or thousands of miles and are not as densely clustered as crashes in urban areas. Systemic improvements can address these rural crashes because they focus on high-risk roadway features not specific locations. As an exercise, examine the fatal crash locations in your State from year to year. What do you see? You will likely see fatal crashes occurring at different locations across the system, rather than isolated high crash locations, especially in rural areas. Now look at fatal crashes by crash type in your State. What do you see? You will likely see that the same type of fatal crashes occur from year to year. While it is not possible to predict where fatal crashes will occur, it is possible to use the roadway characteristics associated with particular severe crash types to predict the locations that are most likely to experience a fatal crash in the future using the systemic approach to safety. The approach is also beneficial for urban areas particularly in addressing crashes involving pedestrians, bicyclists, and motorcyclists. The systemic approach does not replace the site analysis approach. There is a clear need to continue a level of focus on individual locations with large numbers of severe crashes. The systemic approach is a complementary technique that supplements the site analysis approach and provides an expanded comprehensive and proactive approach to road safety efforts. By using the systemic approach agencies can better meet the requirements for the Highway Safety Improvement Program, identifying highway safety improvement projects on the basis of both crash experience and crash potential to reduce fatal and serious injury crashes on all public roads. The key to the systemic approach is evaluating an entire system using a defined set of criteria, which results in an inferred prioritization that indicates some elements of the system are better candidates for safety investment than others. The system-based approach acknowledges that crashes alone are not always sufficient to establish an implementation prioritization of countermeasures across a system. 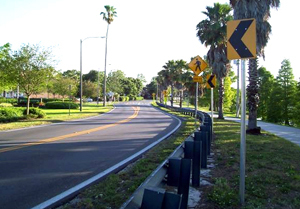 This is particularly true for many local and/or rural streets and highways with low volumes where crash densities tend to be extremely low and there are few high crash locations, and for crashes in urban areas where vehicles interact with vulnerable road users (pedestrians, bicyclists, and motorcycles). Identifies a “problem” based on a system-wide analysis of the data, e.g., rural lane departure crashes. A significant number of severe crashes are spread over a wide area, particularly on rural and local roadways, and for specific crash types such as those involving vulnerable road users. These crashes are rarely identified through the traditional site analysis approach because it is difficult to isolate high crash locations. The systemic approach provides State, regional, and local agencies an alternative method to address these crash types and fulfill a previously unmet need. Looks for roadway characteristics that are frequently present in severe crashes, i.e., risk factors. Systemic starts with a different premise for identify safety problems, leading to a different set of projects. Site analysis is based on crash history at individual locations. The systemic approach looks at crash history on an aggregate basis to identify high-risk roadway characteristics. The site analysis approach results in safety investments at high-crash locations and systemic leads to widespread implementation of projects to reduce the potential for severe crashes. Focuses on one or more low cost countermeasures that can be deployed widely across the system The systemic approach considers multiple locations with similar risk characteristics. When examining the system as a whole, a particular roadway element may have a high crash experience, and it is more cost-effective to correct the problem on a system-wide basis rather than by individual high crash location. This allows for a wider deployment of low-cost countermeasures. Identifies and prioritizes locations across the network for implementation. The systemic approach considers multiple locations with similar risk characteristics. When examining the system as a whole, a particular roadway element may have a high crash experience, and it is more cost-effective to correct the problem on a system-wide basis rather than by individual high crash location. Data availability dictates the level of detail in the analysis. While a systemic analysis can be completed with nearly any amount of data, using more data will allow for more refinement of potential risk factors. Resource availability determines the extent of improvements that can be made. Resources may also impact the level of analysis that can be completed. An agency's established priorities may define the direction of the analysis. The relationship between the State and local agencies may impact the funding available for systemic improvements on non-state routes as well as the extent systemic improvements are applied to non-state routes.